"This is a wonderful steak dish that was prepared for me when I lived in Argentina. This Argentinean steak dish is quite popular in various restaurants around Buenos Aires." Combine the red wine, salt and rosemary in a small bowl. Let stand at room temperature for 2 to 3 hours. See how to make a simple but amazing marinated flank steak for the grill. Followed the recipe exactly, but used one steak in the slow cooker. 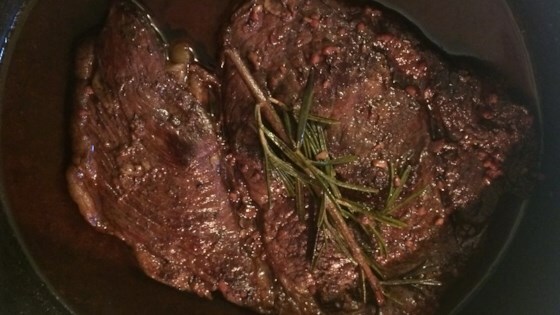 It was a bit overdone; tender but the flavor didn't appeal to us (reminded me of pot roast). Very delicious. Simple to prepare and tastes great. I used dried herbs...didn't have the fresh ones on hand. Thank you for the post. Great result for the ease of it! Just used dried rosemary, and added a drop of Worcestershire and garlic. The kids, who are accustomed to pretty plain and traditional steak, tore this up. Very good. Though since I didn't have any fresh rosemary, I tried it with fresh basil.